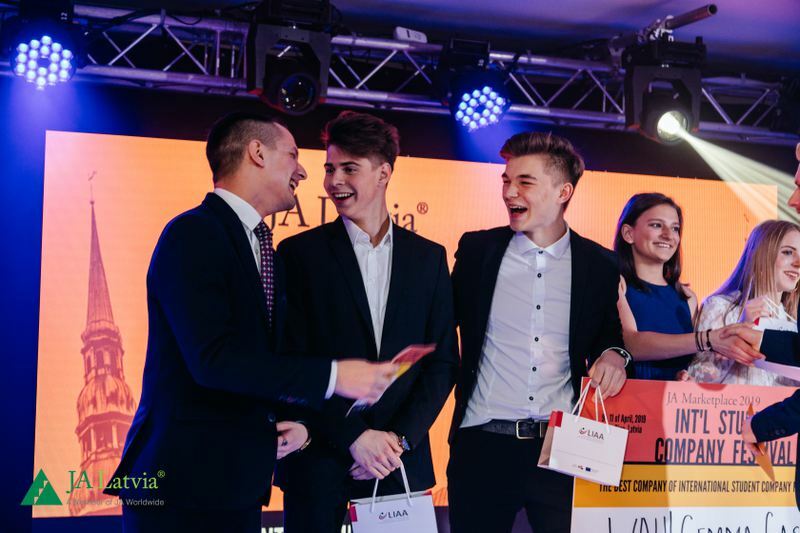 International Student Company Festival (ISCF) organized by the Latvia’s largest education organization Junior Achievement Latvia (JA Latvia), in which 100 companies from 15 European countries participated. The best companies of this year have also been identified in six categories. 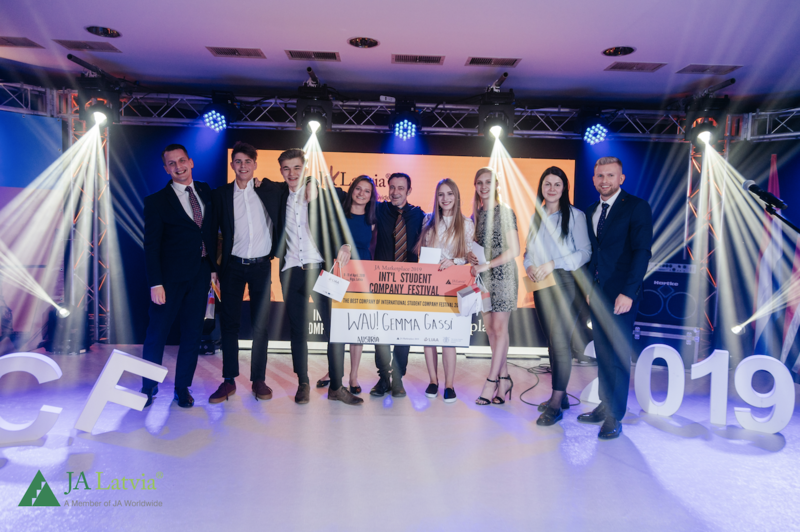 The evaluation and awarding of student companies were carried out in six nominations – Innovative Business Idea, Socially Responsible Business, Best Sales Team, Best Trade Fair Display Stand, Best Video Advertisement and The Best Student Company of ISCF 2019. Individual award was also given by Alumni of JA Latvia. The Best Company of ISCF 2019 – the main winner of the event, which has earned the highest total score in all categories – is the company Wau! Gemma Gassi from Austria. This company produces various products for dogs: dog belts, toys and treats. The award for the innovative business idea was given by the company Safety First from Norway, which has developed phone application that acts like smoke detector – the phone warns if the phone itself or phone charger has caught fire. The Norwegian company Keiko UB was recognized as the most responsible business. It has created the game that helps to pay young people's attention to environmental issues in an entertaining way. The Best Sales Team this year was CU Reflex UF from Sweden, which offers clothes and accessories with embedded reflective elements. The Best Trade Fair Display Stand prize was awarded to the company from Latvia Branch&Hang, which produces original clothes hangers for everyday life and design. When preparing for the festival, student companies had to not only prepare their own product and presentation about it, but also the video advertisement. In the nomination The Best Video Advertisement prize went to the company VOIX from Estonia, which has produced a butter pencil – product which helps to smear butter on toasts easier. The Alumni of the Junior Achievement programs also selected their favourites in the nomination JA Latvia Alumni Development Award which was awarded to the company BRAND OF from Estonia. It offers hair care products of natural ingredients. The JA Student Company evaluation in the festival was carried out by an experienced team of local and international business professionals and academics, representing the Latvian Investment and Development Agency, the Latvian Chamber of Commerce and Industry, RTU Riga Business School, Start (IT), Hansaworld Latvija, University of Latvia and its Student Business Incubator, Protectum, Bezrindas.lv, Novikontas Maritime College, TechChill Foundation, public relations agency MRS Group, Latvian State Forests, Domina Shopping, Printful, VISC, Microsoft Latvia, BA School of Business and Finance, Ministry of Finance and JA Latvia Alumni. The international festival gathered 100 students from 15 countries and their educators. The festival was opened with a conference run by RTU Riga Business School, in which students and educators involved in the project took part making mutual contacts and sharing business promotion experiences. It culminated on 10 April with the Trade Fair event "Cits Bazārs". Within the framework of the event student companies showed their products for visitors and jury and traded them. The festival was supported by the shopping centre Domina Shopping and RTU Riga Business School. Informative supporters - Inbox.lv and publishing house Dienas Mediji.